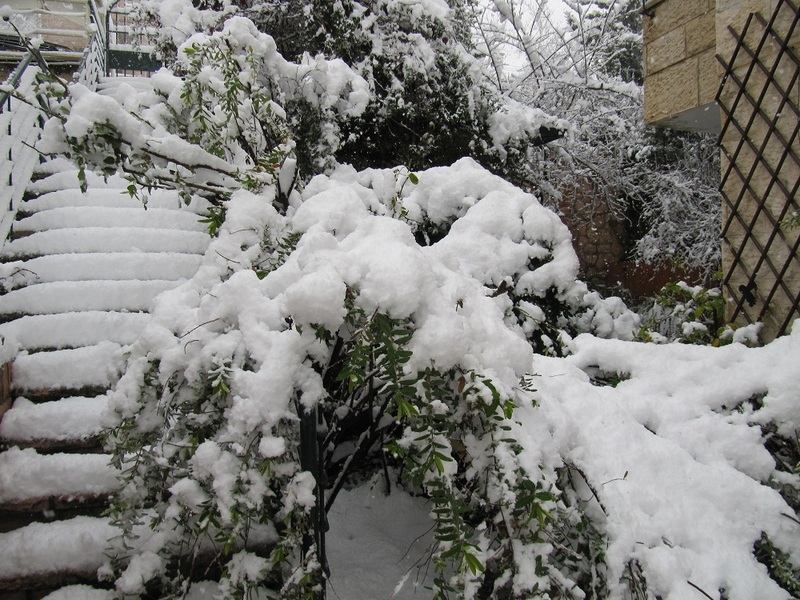 Snow is falling in Jerusalem. I can see white flakes coming down silently as I write this. OK. I know. Many of you are so used to snow that you don’t see it as anything special. But in Jerusalem it’s very special. We don’t get snow every year. Last year it snowed a bit one day, but it had hardly settled when it melted. This time, we have real snow. 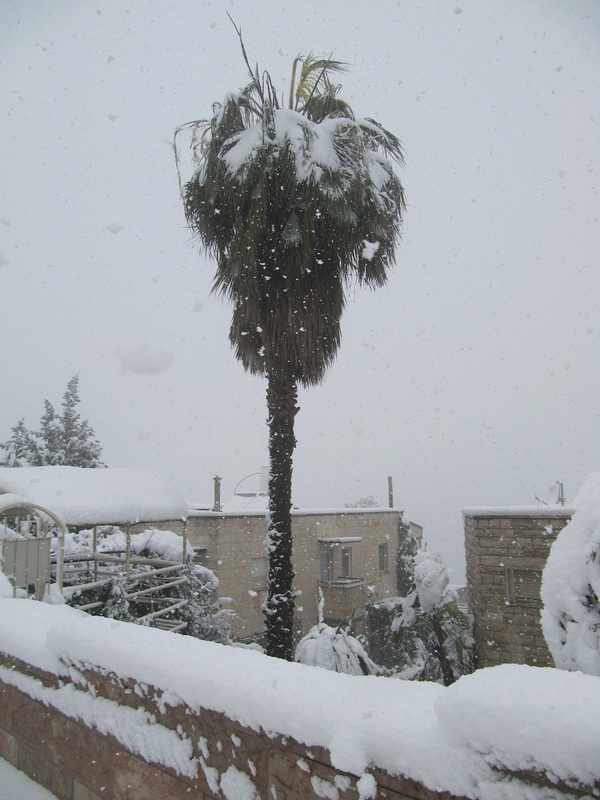 And besides, how many of you have seen a palm tree in the snow? Most homes in this country never see snow. People travel to Jerusalem to see it – if they manage to get here when the roads are closed. So forgive me my excitement on this unusual day. Tomorrow, when the snow has melted, we’ll think about how to clear the path to the front garden. 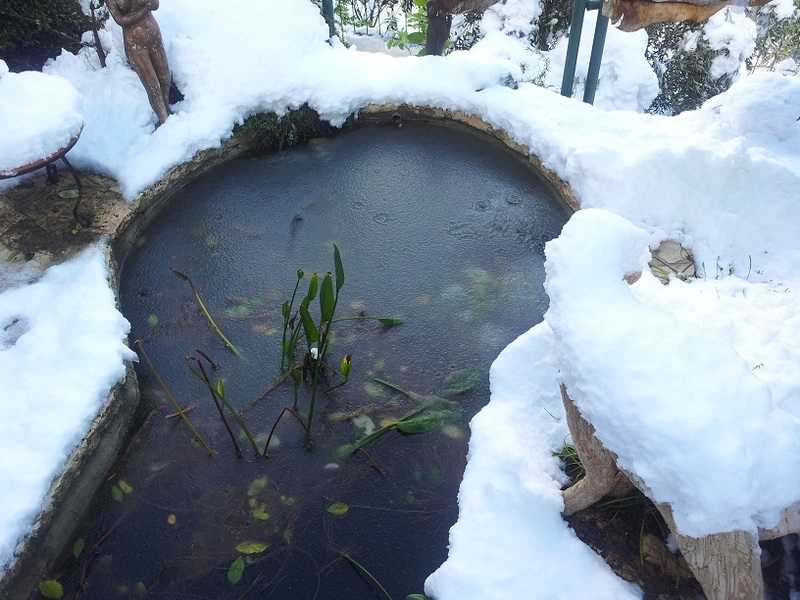 Update: I had to add this photo of our pond taken by my son. Beautiful. We’ve been told to expect snow in the UK over the weekend, but it never usually comes down as far as me. Enjoy making snowmen! Lovely pics although I hope it’s gone when I visit in May! When you come in May, you won’t believe there could have been snow here. I have enjoyed it today. Now it’s nighttime and tomorrow it can’t last. Whee…coming over to make paw prints in the snow! Hurry – it’s melting today. Yowsa. Weather is crazy this year. Australia is having the hottest summer on record. It snows here all the time and it is always exciting. Sometimes, though, it can be a bit much. See my post http://birdiesiview.wordpress.com/2013/01/17/indoors/ Love the picture of the palm tree. wealth along with all of all across advantageous boy.